Compare Razor Electric Scooters: Buy E90, E100, E100 Glow, E200, E200S, E300 or E300S? You don't have to be a teenager to enjoy an electric scooter which comes with a number of advantages when compared to other means of transport. First of all, these scooters are affordable and environment friendly as they do not need any gasoline to run and cost so little to buy. They are also convenient as you can ride them just about anywhere except on highways. Their maximum speed is usually under 20 mph which makes them quite safe compared to other motorized transportation means. They are very compact and can be stored in small places at home or wherever you go. Last but not least, they are so much fun to ride! 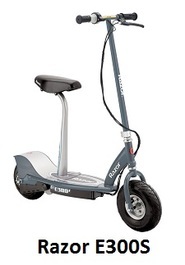 There exists a number of designs of electric scooters, but the most popular are those that allow you to stand up while riding, and those with a seat and foot support. Note that the seat is often removable so that standing up riding is also possible when desired. 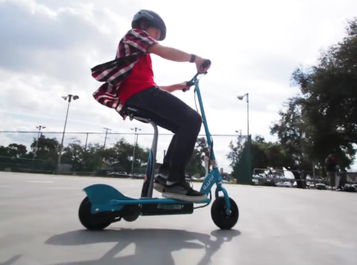 The no-seat scooters are usually preferred by younger riders and teenagers who can easily stand on the foot rest and ride for longer periods of time. Note that it is always recommended to wear a helmet when riding a scooter. Razor is the brand that specializes most in affordable scooters of all types, including electric scooters, and Razor electric scooters are no doubt today the most popular. But Razor makes a number of electric scooter models, and it might be hard to decide which would be best for you or the teenager you want to buy one for. 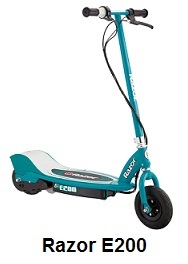 Razor electric scooters that are most popular are the E90, E100, E100 Glow, E200, E200S, E300 and E300S. This article will provide a detailed comparison of these scooters so you can easily make the right choice that corresponds to your needs. 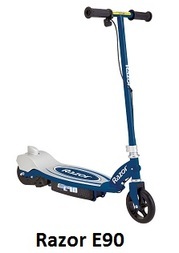 Note that these Razor electric scooters have also been the most popular among Amazon customers, and at the time this article was written, they had received excellent reviews from most Amazon buyers with an all-model overall average rating of 4.5 stars out of 5 stars!. Batteries used in all models are sealed lead acid and rechargeable batteries. A charger is included with all models. The motors of Razor E90, E100 and E100 Glow require a small manual kickoff to start. On the other hand, E200, E200S, E300 and E300S start off electrically from a standing position, and once on the move, their powerful electric motor ramps up to speeds fast enough to have fun, but not fast enough to present a danger on the sidewalk or the road. E90 has urethane rear and front wheels. E100 and E100 Glow have a 8" pneumatic front tire and a urethane rear wheel. E200 and E200S have 8” pneumatic front and rear wheels. E300 and E300S have 10” pneumatic front and rear wheels. Padded seat is easily removable for stand-up riding. The Amazon prices shown in the table vary depending on the color of the scooter chosen. These prices were in effect at the time this article was written and may have changed. For exact prices, please refer to the Amazon products section below. Note that the Amazon price often includes a generous discount to the list price. If a discount exists, both the Amazon price and the list price will be displayed when you click the Amazon product link images below. Now that you have all the characteristics of all the electric scooters offered by Razor, you should be able to select below the one that best matches your requirements or the needs of your child or teenager. 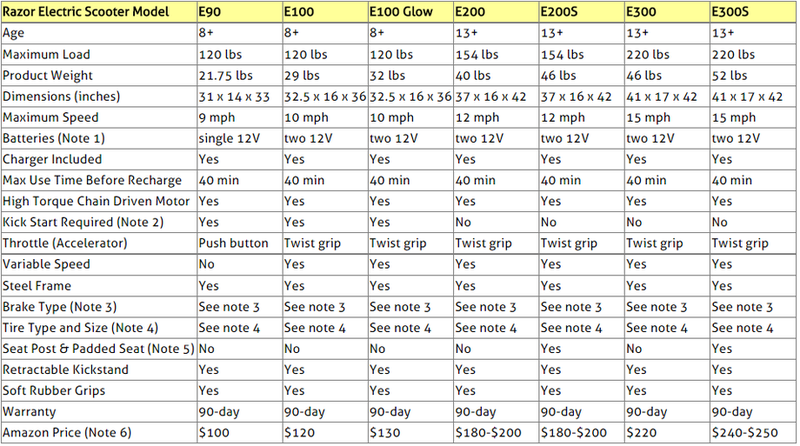 Razor E90, E100, E100 Glow, E200, E200S, E300 and E300S electric scooters are all available below on Amazon. 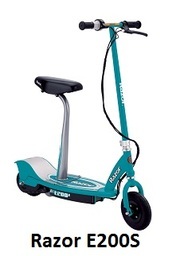 When you click the scooter images below, you will get additional colors to choose from whenever available. Please click the scooter of your choice below for price information or to purchase. If you'd rather have a more sophisticated and slighly faster scooter, you might want to consider also the SWAGTRON electric scooters which are equipped with an LED screen that allows sophisticated runtime controls (such as cruise control) and runtime diagnostics display. For a comparison of SWAGTRON electric scooters, please click: Comparing SWAGTRON Electric Scooters.